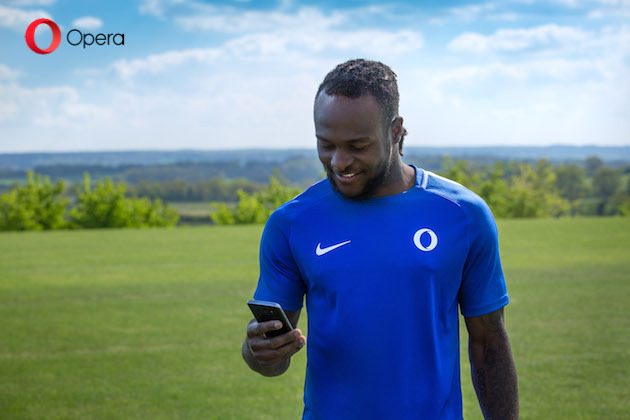 Opera is kicking off a partnership with football professional Victor Moses, Chelsea starter and Nigerian national team star player. Moses will be the brand ambassador of Opera Mini, the most popular browser in Africa. Starting today, Moses will be featured in the new Opera Mini TV commercial as well as a range of collaborative projects extending throughout 2018. This coincides with Opera’s recent announcement to invest $100 million USD (30 billion Nigerian nairas) in Africa over the next two years with the goal of strengthening the internet ecosystem in countries such as Nigeria. Nigeria is home to the second largest population of Opera Mini users. Search, social networking and sport are the most popular content consumed by Opera Mini users in this country. One fourth of them check out live scores and sports news when browsing. This number is relatively higher than the ones in other African countries. Opera recently launched its first nationwide TV and radio commercials to announce a faster and more affordable internet experience with the Opera Mini browser. Already airing in South Africa and Kenya, there will be a special version for Nigeria. Victor Moses will be challenging his on-field speed against Opera Mini’s. Well known for his current Premier League signing with the top Premier League club Chelsea, the 26 year old has grown a successful career throughout the higher level leagues of the sport from an early age. This includes an earlier career boost with Crystal Palace, as well as performances for Liverpool, Stoke City and West Ham United. His outstanding performance has earned him “The Premier League’s most remarkable star” by the Sun. Founded in 1995 in Norway, Opera delivers browsers and AI-driven digital content discovery solutions to more than 320 million people worldwide. The company remains one of the most innovative browser creators in the world. Opera is listed on Nasdaq under the OPRA ticker symbol.